A Ducking They Did Go is one of the Three Stooges classic short films, where Moe, Larry and Curly are on the run from the law – after trying to steal watermelons off a truck. Looking for cover, they dash into an office for the Blackie and Doyle Canvas Back Duck Club, who are looking for salesmen to sell memberships in their duck club. 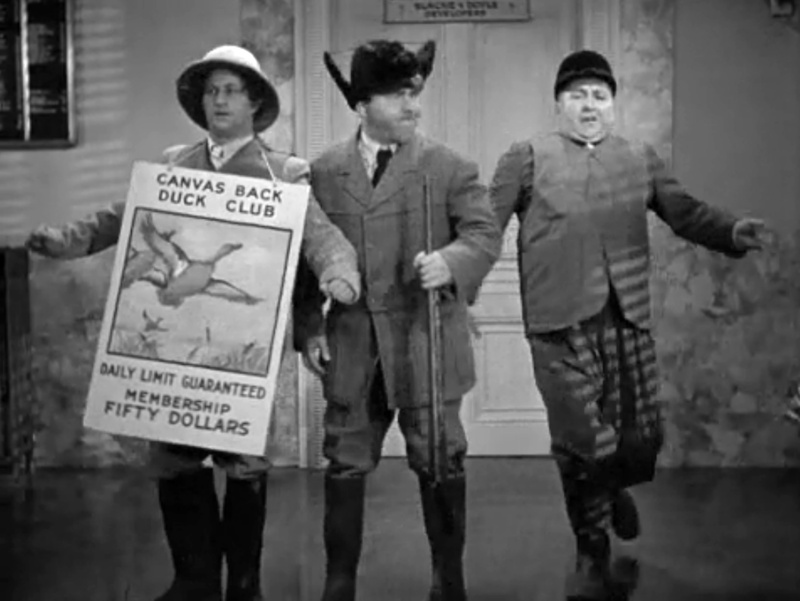 Being desperate for salespeople (as well as actually being con men), Blackie and Doyle agree to hire the Three Stooges as salesmen to their duck club. Needing both income and to hide from the law, the Stooges agree — and try to sell a membership to Three Stooges regular Vernon Dent, in a very funny scene using a falling-apart suit — and, to add insult to injury, he’s a vegetarian! 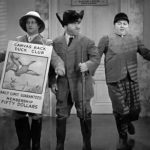 The Three Stooges are undaunted, however, go on to continue trying to sell memberships to their duck hunting club, only to run into the same pursuing police officer outside of the building. Again on the run, they run for cover into … a police station? Yes, of course — they all have guns already! What could possibly go wrong? At first, all goes well at the cabin, with Moe, Larry, and Curly singing alongside the Mayor and the Police Chief — until they’re all told that there are no ducks in the area, and there haven’t been for years! and Curly comes to the rescue as the pied piper of ducks! This leads to some funny slapstick at the Three Stooges match wits with the ducks … only for the ducks to win effortlessly. There’s a “duck spitting water at Curly” scene reminiscent of the clam chowder scene in Dutiful but Dumb, as well as the ducks hiding on Moe’s back, Curly’s head, etc. Although initially it seems that all is well, it turns out that these ducks are domestic, and the farmer wants five dollars per duck! The police aren’t happy with that, either, and the short ends with the Three Stooges on the run from the law … again. A-Ducking They Did Go is available on The Three Stooges Collection volume 2. Blackie: You men ever sold anything? Curly: Why certainly, anything we could lay our hands on! Blackie: Ah, gentlemen, gentlemen! With this proposition you can’t go wrong! Remember this, boys, every red-blooded man is a potential hunter at heart. Why, there’s one in every office! Doyle: That’s right, boys, all you have to do is appeal to the primitive in ’em, and you can’t go wrong. Curly: Ducks, ducks … oh, wanna buy some ducks? Is your blood red? Are you a potent hunter? All you need is a prime appeal. How about a duck? There’s one in every office! Curly: Every red-blooded he-man is a potential hunter! Thereâs one in every office! Curly: Got a piece of bacon in your pocket? Curly: You keep em busy I’ll get some eggs for breakfast. Moe: You try that and I’ll crack your head like aneggshelll. Moe: Spread out and remember, ducks is ducks and cash is king. Curly: And never the twain shall meet. Vegetarian in hallway (Vernon Dent): I don’t eat ducks, I’m a vegetarian! Moe: Well eat the vegetable see and leave the duck! Come on! Larry: [after Moe slaps him] What’s that for? I didn’t say nothing! Moe: It’s for what you were thinkin’! Curly: My mind’s a blank! Moe: What did you do that for? Larry: I made another hole for the water to go out!